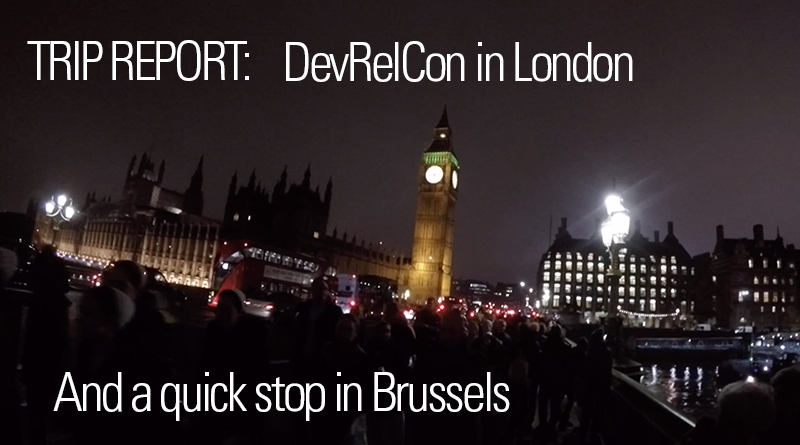 DevRelCon is a Developer Relations conference in London. I’ve attended the 2015 edition and was keen to return for this edition. The trip report takes me from my home in Diksmuide, to Lille Europe railwaystation in France, to London St-Pancras International Station. I stayed in London for 3 days, but had to leave earlier to deliver a last-minute keynote presentation at the annual FeWeb conference in Brussels. I usually arrive a day before any international conference. It allows me to get adjusted and get a decent night’s sleep. I booked 2 nights at the Town Hall Hotel & Apartments in London, near Bethnal Green. I took a 2-bedroom apartment which was absolutely amazing. The original plan was to take my wife and kids, but due to personal reasons, my family couldn’t join me. Luckily I had some friends who were willing to come along for the trip. We got comfortable in the hotel, I put in some work, took my friends for an evening walk through Westminster and ended the evening with some amazing sushi at Sticks’n’Sushi in Canary Wharf. We ate more than 125 pieces of sushi with 4 people. December 7th, conference day. DevRelCon took place in Barbican Centre, the iconic arts center. Brilliant venue, loved the botanical garden on the 4th floor terrace. The lineup was great and the talks addressed some genuine issues that Developer Relations people have to deal with. Measuring success is still the main question, but there was also some focus on DevRel strategy. I saw some old friends, made some new ones and I managed to interview my friend JAM. The video will be available soon. The goal was to stay in London until the evening of December 8th, but there was a change of plans. My company arranged a last-minute keynote slot for me at the annual FeWeb conference. FeWeb is the Belgian federation for web professionals. I was asked to present my vision on webhosting in the year 2020. Go to my speaker site to get all the details. It was a good week and I was glad to be on the road again. Although being abroad and traveling is fun, it’s still tough. My family was home and could have used my help. On top of that our house is undergoing serious reconstruction. There’s also some fatigue involved and I lost my voice. I’m not complaining though, it’s a great job and I love it, but it’s not as “easy peasy” as you’d think.